During the 1970s, internationally renowned fresco artist Ben Long created magnificent enduring works in two small antique churches in Ashe County. Each is significant to the Christian community. His first frescoes were done in Saint Mary’s Episcopal Church on the southwestern edge of West Jefferson. There you can see his images Mary Great with Child, John the Baptist, and The Mystery of Faith. 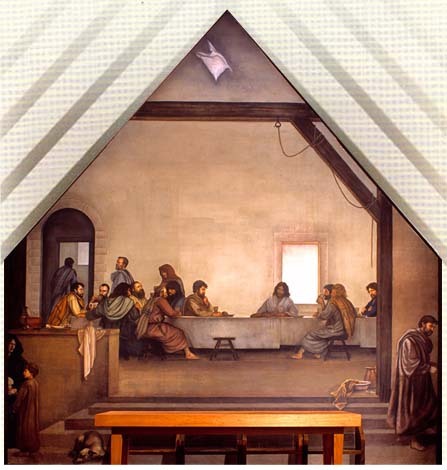 This was followed a few years later with a life-size depiction of The Last Supper at Holy Trinity Episcopal Church in Glendale Springs. Thousands of people visit the frescoes each year - both for their religious significance and because they are magnificent works of art. Many people visit repeatedly. And for those of us who live in Ashe County, we go often because it is the favorite place to take guests. Our frescoes are a major tourist attraction, and are important to the region's economy. Those who visit Ashe County for the frescoes experience typically include visits to our art galleries, restaurants, shops, and the unique cheese factory in West Jefferson. Outdoor activities, the New River and some great lodging places are also attractions. Ashe County Frescoes Foundation was created by community members for the express purpose of protecting and preserving these works of art. Our organization is established as a North Carolina nonprofit corporation with a board of directors – a majority of whom cannot be members of the Episcopal congregation. Donations to our organization are used only for expenses related to these unique and great works of art. All donations to help with our mission to protect and preserve the frescoes are appreciated. Contributions are deductible to the extent allowed by law. For information about how you can help with contributions or services, please contact Ashe County Frescoes Foundation, P.O. Box 912, Jefferson, NC 28640.